My “aunty” Ethel Ledger (grandma’s cousin) with her angoras, pre 1920. This is the earliest known UK photo of angoras. The Shorter Oxford English Dictionary, 1983. The minute I saw that “Angola Wellingbro”, I suspected it was a reference to “angora” wool, but wasn’t sure til I got home later and looked it up. Wellingbro must have been a known source of angola or angora wool. The same records refer to “Irish linen” and “Knaresbro’ linen” – when a placename is included with a type of cloth, those must have been well known centres of production. Evidently, angora stockings were top end. It’s a fair assumption that the angora yarn was knitted for stockings. Most of us who have angora bunnies or have spun angora can testify to the fibre’s felting ability! Which is something you could harness for good or for evil. There are several Wellingboroughs in England, but my money is on Wellingborough Northamptonshire, as being the place famous for its angola. Wool was produced there from the 14th century, and beyond that “wool remained an important factor in Wellingborough economy”. (British History Online). It’s possible any woven goods from Wellingborough, blended angora. If you blend down to around only 10 angora, you still get some of its halo and other characteristics. This cloth must have been smooth, and well milled. Angora knitted stockings might sound fragile but I’m guessing the felting on the foot would make it hard-wearing. Angora fibre is incredibly warm – many times warmer than sheep’s wool of the same kind of grist. As the patient was buying in September, with winter coming, he probably felt the cold! There are newspaper advertisements from later in the century, for “woollen” cloth woven from angora – which may or may not have been blended with sheep’s wool. This advertisement makes it sound like angora was sometimes used for a sort of flannelette, ideal for night-clothes. In a world with no central heating, and where even if you had fireplaces upstairs, you’d rarely use them, this would make sense for winter. In my 1960s’ childhood, I can remember we thought nothing of there being frost on the inside of the windows, some mornings. … Black or coloured Doeskins, or Angola Trowsers, in the newest style of cut from 18s to 21s…. So there is evidence for knitted and woven angora/angora blends, in the nineteenth century. As well as evidence for hokey Hollywood ‘history’ (you can always tell when an ‘historical’ movie was made from the lipstick/hair-dos!) Searching for the term “angola” may give more results than “angora”. 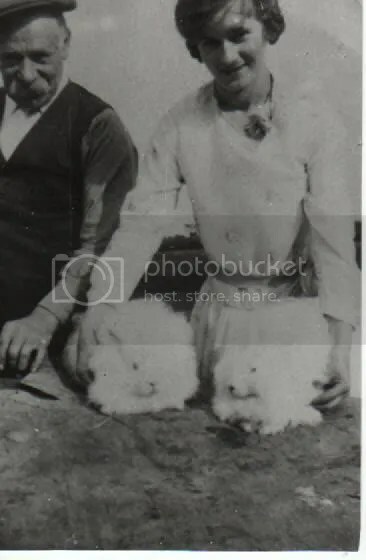 I always loved the photo of my aunty Ethel with her bunnies. She lived at the mill at South Duffield, quite near where, 100 years on from that photo, I have three angoras, too. One is English, two Continentals. I have a limited amount of angora fibre – excess from my own bunnies, Nigel, Elsie and Charlie – for sale on eBay, right now. It is hard for non bunny owners to get hold of, and the commercial rovings sometimes may come from questionable sources. Commercial tops also don’t spin up the same as your own bunny fluff. I only have small amounts that I haven’t spun up, myself and decided to sell rather than hold onto – and it’s been stored in a cedarwood chest so be warned – it smells of cedarwood but this should wash out after spinning! But take a look if you’re interested. Even 25g blended into say 200g of wool would give you angora softness and silkiness. Pure angora tends to be too warm to wear! Cotton cards work well for blending, or do what I do and spin 1 ply angora, 1 ply silk or wool. I will leave you with this picture of my beautiful girls, Elsie and Charlotte. Today they are out in their run, in the sunshine, eating grass and lemon balm. Buns like to live in bonded pairs – these sisters are inseparable! A friend of mine raises angora bunnies and now has a side business selling yarn. Her company is called Toots LeBlanc, her grandmother’s name. Her yarns are listed on Ravelry. They’re all blends and all gorgeous natural colors. The angora is all blended 40/60 with merino. She also has some Jacob blends that I love. She has all the fibers processed and spun by a small mill. I have quite a bit of her yarn, of course, but the only project I’ve knit so far is a merino/angora scarf in a beautiful light grey. And of course I haven’t photographed it. Could Angola refer to mohair too? As a child in the 1960s, I was once wrapped in a hairy blanket that my great grandmother called “the angola blankie”. On being asked why it was called that – she explained it was because it was made from mohair. This of course, made no sense at the time but now I realise it came from the angora goat and I often add a little mohair to strengthen the yarn I spin for socks. Thanks for reminding me of my great grandmother.